Why is Amsterdam called The Wonderful Cultural Epicentre? Amsterdam: The Wonderful Cultural Epicentre! 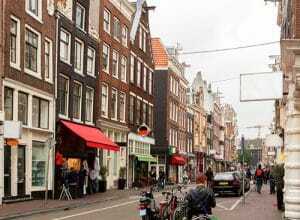 Wonderful Cultural Epicentre: Amsterdam is pretty much the heart of culture in Europe, there’s no doubt about it! The city is filled with wonderful attractions, history, art, culture, food, and nightlife. Amsterdammers have a history of using the swampy area’s river canal network to get around the city – similar to Venice, Italy. The natural beauty of the Dutch architecture, mixed with the canal layout provides for an absolutely stunning backdrop, especially when cycling through the city! Whether you’re visiting The Netherlands or elsewhere in Europe, you’ve just got to check out Amsterdam. One of the most fascinating aspects of Amsterdam is that, like many European cities, it features a ton of social gathering spots known as plazas or squares. These squares allow for a sort of mixed-use space between restaurants, bars, sitting/relaxation, and entertainment. The entertainment part of these squares is the best part about them. In Rembrandtplein (named after the master Dutch painter Rembrandt Harmenszoon van Rijn) and Leidseplein, you’ll find street artists or “buskers” as they’re sometimes called, performing art, music, magic, and other spectacles that are a must see! You’ll also find buskers and street artists performing at some of the enchanting city parks that can be found in Amsterdam, like Vondelpark and Sarphatipark. There are many comfortable, affordable places to stay in Amsterdam proper, but one hostel in particular takes the cake. If you want a great hostel stay experience in downtown Amsterdam, then choose none other than Amsterdam Hostel Sarphati. This hostel is a great bed and breakfast spot that is only a short walking distance from Grachtengordel, Vondelpark, Sarphatipark and the famous 17th Century canals. When staying in Amsterdam, it’s important to be close to where the action is in order to be able to properly soak up all of the fun and adventure the city has to offer!